Shibata Zeshin was the outstanding Japanese lacquer artist and painter of the nineteenth century. An energetic and prolific artist, he earned distinction during his lifetime for paintings that showed unusual creativity. Zeshin painted several works in which animals mimic human behavior. By demonstrating the apparent humanity of the animals, Zeshin creates a kinship between viewer and subject; and because monkeys naturally resemble man in their actions, they were a frequent choice of subject for works of this kind. Painted during Zeshin’s artistic maturity, Waterfall and Monkeys is exceptional for its monumentality of scale and concept. 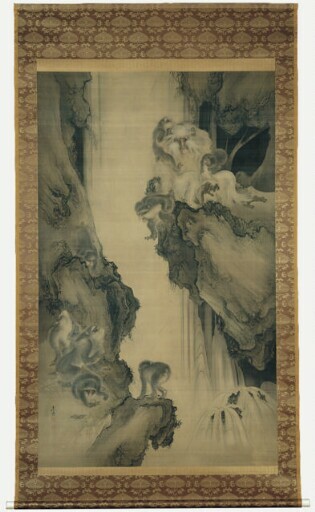 While both waterfalls and monkeys are popular as singular subjects in Japanese painting, this imaginative and humorous combination is unique. Zeshin creates a lively scene of a troop of young monkeys with their beleaguered mother, crawling about the craggy rocks at the base of a fast-flowing waterfall. The naturalness and variety of the monkeys’ poses and expressions suggest that Zeshin observed simian behavior firsthand. His interest in realism is further apparent in the delicate rendering of the monkeys’ fur, from the soft washes and short, fine lines that define the youngsters’ coats, to the longer, fluid strokes of the mother’s thick hair. A large and ambitious painting, Waterfall and Monkeys demonstrates Zeshin’s sure sense of space and compositional balance.